Asia is the continent of high mountain hunting, a paradise for hunters and adventurers. The main destinations are central Asia republics that belonged to the former Soviet Union: Kazakhstan, Kyrgyzstan and Azerbaijan. In the immense mountains we can find Ibex (bezoar Siberian Asian), Tur, Marco Polo, Argalis, woolfs, Siberian Roe Deer, Maral, Boar. Kyrgyzstan is one of the most mountainous countries in the world, since about 75% of its territory is occupied by hills and ridges. Because of this, we should not wonder its low population – in the area of ​​200,000 km2 live only 5 million people. 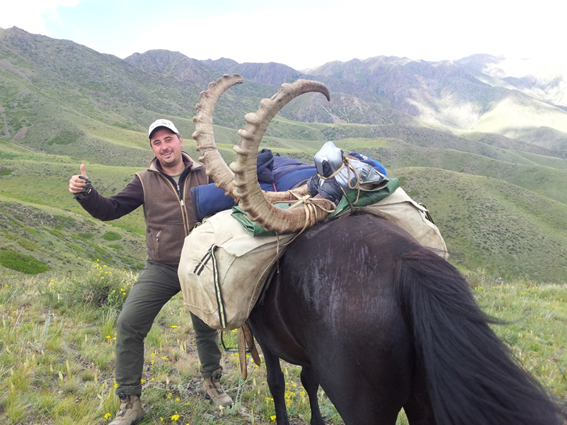 Ibex stalking takes place in the snowy mountains of Tian Shan, between 3,000 and 4,000 meters above sea level. Kazakhstan is located in the center of the Asian continent and is the largest country in Central Asia, and the world’s ninth largest. This vast territory gives rise to different types of terrain and habitats, from large forests to deserts. In this country we find one of the world’s largest population of Ibex. Azerbaijan is characterized by one of the steepest and highest mountains of the world – the Caucasus Mountains, which are the domain of Tur. The large population of this species makes Azerbaijan the best destination for stalking this trophy. The altitudes ranging between 2,500 and 3,000 meters, but do not be misled, it is one of the most difficult hunts in the world. To hunt in most of these destinations good physical conditions are required, otherwise we could thwart one of the most exciting and rewarding hunts we may have.